1978’s Halloween marked the arrival of John Carpenter, but it was his follow-up two years later that confirmed that he was here to stay. Like many of his efforts, The Fog wasn’t warmly received upon release, and it was perhaps his refusal to accept a slasher pigeonhole that turned contemporary audiences off; little did they know that his resistance would eventually become a defining trait, as Carpenter was well on his way to constructing a multifaceted oeuvre. Even while working in the confines of the horror genre in The Fog, he traded in a suburban boogeyman for a gothic spine-tingler, and the result is a typically graceful effort. If Halloween is a story relayed in schoolyards, then The Fog is a campfire best reserved for the witching hour, a notion Carpenter literalizes with fireside prologue featuring a rapt audience’s introduction to the Elizabeth Dane, an ill-fated vessel that crashed upon the shore of nearby Antonio Bay one hundred years ago. Legend holds that a terrible fog and shore fire led the ship astray before it wrecked and was plundered of all its gold. With Antonio Bay set to celebrate its centennial, the legend becomes reality as the conspiratorial sins of the town’s fathers are visited upon the sons and daughters. Naturally, the film deliberately unfolds like an encroaching fog bank, as a drawn-out credits sequence finds another portrait in small-town Americana curling up on the screen in Antonio Bay, a sleepy seaside retreat with a handful of local dives, sort of like a less creepy version of Halloween III’s Santa Mira. The stunning sequence is blanketed in the eerie, glowing mist that begins to permeate the town, which is soon besieged by strange phenomena: car alarms mysteriously blare, supermarket wares mysteriously explode on the shelf, and enigmatic figures shrouded in the fog begin to pay the citizens a midnight visit. Perched in a lighthouse, sultry-voiced DJ Stevie Wayne (Adrienne Barbeau) lords over its airwaves while delivering news and weather reports at a jazz station. Carpenter continues to fill in this tableau with a host of locals: a rebellious poor-little-rich-girl hitchhiker (Jamie Lee Curtis) and her ride (a disconcertingly un-mustachioed Tom Atkins, who doesn’t need the ‘stache to bed the girl immediately), a finicky councilwoman in charge of the town’s impending festivities (Janet Leigh), and a priest (Hal Holbrook) who stumbles upon the town’s lurid, hidden history that will now require a blood sacrifice as retribution. Among the damned is the salty crew of a small trawler that gets caught up in the inexplicable fog, which features the unvanquished spirits of those who perished all those years ago. Now taking the form of shaggy boogeymen, they proceed to dispatch the crew with an assortment of sharp implements in a sequence that best approximates the visceral terrors of Carpenter’s previous efforts. After that, however, he’s much more preoccupied with classical scares—in fact, the aftermath, which finds Atkins and Curtis scouring rusted-over boat for clues, features an elaborate setup for a bait-and-switch jolt that’s more frightening than the preceding impalements. Between the casting of Leigh and a jaunt to Bodega Bay, Carpenter’s Hitchcock hero worship is obvious, but The Fog also echoes the gothic, atmospheric horrors of Castle and Corman. It’s an exquisitely-realized throwback, of course, as Carpenter gathered what essentially became something of a house band. He’s reunited with Curtis and Charles Cyphers, while a host of familiar faces assembled behind the scenes, with cinematographer Dean Cundey once again bringing elegance to the macabre proceedings along with Tommy Lee Wallace’s sturdy set design. Debra Hill co-wrote the script with Carpenter, and her contribution is arguably felt in the homespun authenticity of its characters. On paper, The Fog should be languid and aimless—it features no real protagonist, preferring instead to roam from one character to the next after its inciting incident (the ghastly murder of the sailors). However, the characters are convincing and unpretentious that resist cliché—these aren’t archetypes but rather everyday people forced to confront the inexplicable. Like Halloween before it, The Fog doubles as slice-of-life horror. The Fog also shares its predecessor’s efficiency. Carpenter’s hand might be steady and deliberate in its execution, but the film thrives on the unfettered leanness of a ghost story. In an age where films engage in convoluted narrative gymnastics in an effort to impress audiences, The Fog is a refreshing reminder that we need only be convinced and drawn in with atmosphere and flourishes. In fact, the film’s remake stands as an example of misguided storytelling, as it mistakenly chooses to make Carpenter’s subtext into the text; here, hitchhiker Curtis glibly refers to her bad luck, while her counterpart (Maggie Grace) 25 years later becomes an unwitting instrument in the spectral revenge (having said that, let’s never speak of the 2005 version again). Despite having seen the film nearly a dozen times, it’s easy to forget that The Fog actually occurs in the midst of spring. It’s so enfolded in an autumnal, twilight vibe that it’s easy to assume that Carpenter returned to the scene of his previous seasonal crime. Regardless, the film makes for a perfect Halloween viewing—it has long been a staple of my own personal rotation, as no October is complete without Carpenter’s eerie, synth-laden chiller. Likeminded fans will be in for a real treat this year, as The Fog finally arrives on Region A Blu-ray thanks to Scream Factory, who has put together another stellar release. Cundey personally supervised the new transfer, and the result is a staggeringly vibrant restoration that remains faithful to the film’s original look by refusing to digitally scrub the grain structure. The Fog has never looked better on home video, and the same can be said for the audio, as the disc offers both 5.1 and stereo DTS-MA tracks. As usual, Scream Factory’s supplements are lined with new and old features. The imported material includes a commentary with Carpenter and Hill, vintage featurettes “Fear on Film” and “Tales from the Mist,” outtakes, a storyboard-to-film comparison, and various promotional material. For its new release, Scream commissioned a new commentary with Barbeau, Atkins, and Wallace, and the trio warmly reflect on their experience making the film. Both Cundey and Curtis drop by for separate, recently-filmed interviews that find both reflecting on their career beyond The Fog. Cundey describes the circumstances that led to his collaboration with Carpenter, and he proceeds to discuss them all (he’s especially proud of the technical advances they achieved on Escape from New York). Curtis, on the other hand, reflects on her career and a scream queen, and she pulls no punches. While she’s grateful for the opportunities it provided and has no regrets, she also knew when it was time to quit. 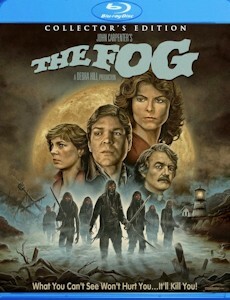 The actress is even more frank when discussing The Fog itself, which isn’t her favorite of those early 80s offerings; furthermore, she describes the awkwardness of being on set with Carpenter and Hill, who had recently split as a couple (meanwhile, Carpenter had moved on to Barbeau), so it was akin to working with divorced parents. Finally, Sean Clark returns with another episode of Horror’s Hallowed Grounds. It’s a typically breezy but informative stroll back to the film’s locations, many of which haven’t changed too terribly much. Watching this will also give audiences an appreciation for movie magic, as Carpenter fit these disparate pieces together like a seamless jigsaw puzzle. For example, the church that seems to be in the middle of nowhere actually rests right in the middle of a neighborhood. Having seen more than a few of these things now, I’m convinced that Clark has the best possible gig in show business, even if it does entail being stalked by Robert Rusler. While it’s unlikely that many horror fans don’t already have some iteration of The Fog on their shelf, this Blu-ray is a worthwhile upgrade in every respect. The only problem is that Scream has released it in the middle of the summer; my recommendation is to grab it as soon as possible, but resist the urge to watch it until the first autumn mist creeps up on your lawn in a few months.